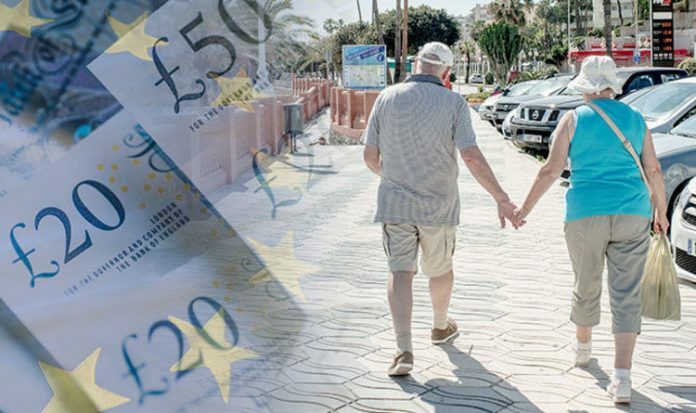 The warning to “Brexit-proof” their finances for the 1.8 million British expats living across the EU has come from the world’s largest independent financial advisory, deVere Group. If the pound plunges in the wake of a no-deal exit, the cost of living would be more expensive for expats, according to the group. DeVere claims expats pensions could also be at risk in the event of a no deal. James Green, divisional manager of Western Europe at the deVere Group, said: “A no-deal Brexit is now expected by a growing number of experts and the wider population to be the most likely outcome. Mr Green said he advises UK expats to review their finances with a cross-border financial expert. He said: “They should seek to make their financial strategies ‘no deal Brexit’ proof”. The comments from the expert have come as the government publishes technical notices on the preparations being done for the prospect of a no-deal Brexit. However, the Brexit Secretary Dominic Raab has said that he believes a deal is “within our sights”. The Irish Foreign Minister, Simon Coveney, has said that he believes that the chances of a no-deal Brexit are still very slim. He said: “I think talk of being able to survive or manage a no-deal Brexit is more a negotiating position than it is reality. The MP for Worcester City Robin Walker has also said he believes that the government will get a “good” Brexit deal. Mr Walker said to Worcester News: “There will be different views within government and within the party towards the different types of deal. One government white paper on Brexit has proposed a rule equivalent after Brexit for financial services which would allow the EU and the UK to have access to each other’s markets. However, nothing has been agreed yet. Association of British Insurers director of regulation Hugh Savill said: “Leaving the EU without a deal would cause major inconvenience to millions of pensioners, travellers and drivers. The Bank of America has warned that a no-deal Brexit could cause central banks to sell up to £100 billion of Uk bonds. Cabinet office minister, David Lidington, has warned that the only alternative to Theresa May’s Chequers plan is a no-deal Brexit.